and the young leaves are also fantastic in salads. 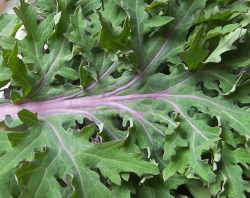 A traditional variety from Tuscany, also known as Palm Kale or Black Tuscan. The long leaves are quite deeply savoyed, but not as frilly as curly kale, so much more resistant to aphids and whitefly. Normally used as a cooked vegetable, but this has such a nice flavour that we eat the thinnings and baby leaves raw in salad. As well as sowing in Spring , you can also sow it in a polytunnel in late summer/early autumn and pick a few leaves at a time all winter when other salad ingredients are scarce. When it finally bolts, the flower shoots are a gourmet treat raw or cooked. Delicious. Sow spring/summer for use late summer through into winter. 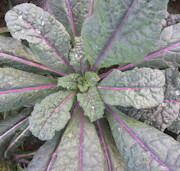 An amazing kale bred specially for home gardeners by Hank Keogh at Gathering Together Farm, this is a blue-green palm kale with a striking pink midrib. This one is a real performer and has become one of our most reliable kales in the garden. It performs really well, and tastes great - like a Tuscan kale but with a lighter & fresher flavour; probably the best-tasting kale we've got. Eye-catching , excellent flavour and very winter hardy..
We are pleased to introduce this hardy grey-green kale that has been selected for its profusion of tender shoots in spring. While you can take leaves to eat as you would with any kale, this variety has particularly sweet tasty sprouts in spring, like a green version of sprouting broccoli. Keep picking them so it doesn’t stop production. Seed produced for us by Debbie Rees at Blaenffos. We tried it out and were really impressed. It is the most vigorous and resilient kale we have seen. It shrugged off attack by aphids, cabbage white caterpillars, ravenous goats, and 70 mph freezing sleet overwinter. In each case it sprang back, growing new leaves with no trouble, and forming large heads of Kale in spring when at its most valuable. 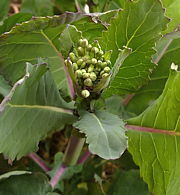 And when it starts to bolt in spring, the flowering shoots are good to eat too, very much like sprouting broccoli shoots. 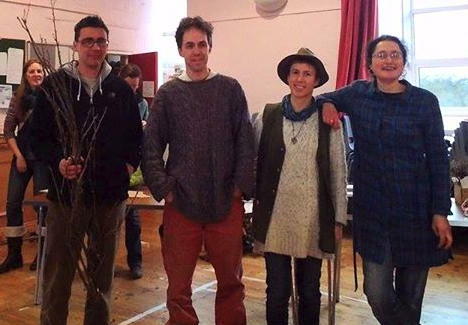 The old lady the Kale came from is Elizabeth Woolcombe, of West Drummie in Sutherland. She is in fact 93, and her daughter has remembered where they got the Sutherland Kale from. It was given to them by Angus Simmonds about 50 years ago, he was doing research on Kales at Edinburgh University at the time." Its really nice to know a bit more about this Kale, and good to learn that it was chosen as being particularly valuable by someone working on Kales in the past. Give it a try, your orders directly support our efforts to keep this variety in production. A real success story for home seed-saving. This was - as far as we know - extinct other than the few seeds given to us. But since we rescued it, multiplied it up and offered it in the catalogue, people have saved their own seed grown from our packets and we have had happy reports back from all over the country and even Europe. Do keep your own seed using the instructions supplied! When? For sowing in spring, transplant out when bigger, and harvest in autumn / overwinter. One of the hardiest kales there is - a classic red-russian type, created by Tim Peters of Peters Seeds and Research Co. He bred Western Front from the 10% of survivors of hard freezes that killed all others in his trials including Scotch, Russian and Siberian kales. Our friends at Adaptive Seeds (who are now maintaining the variety) are prioritising selection for cold-weather tolerance rather than uniformity, so there is still quite a lot of colour variation, but is is very hardy. This is a great kale particularly useful for winter and spring harvest. The large upright plants have beautiful deep red-purple leaves with a unique shape - gently frilled at the edges. It was bred by kale expert Frank Morton specifically for home gardeners - with emphasis on extra cold resistance and flavour. The leaves are tender and sweet even when big, and the flowering shoots when it finally bolts are also very nice both cooked or in salads. Sweet & Hardy. Very rare. If you like it, keep your own seed using the instructions supplied! 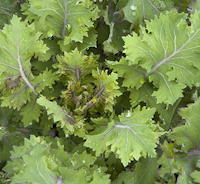 A fast growing Kale, with large frilly blue-green leaves. This great kale (originally from Seeds of Change) was given to us by Andrew and Sarah, the ‘Seed Ambassadors’ who toured many small seed collections in 2006, taking the best varieties from one country to another. We really like it because not only is it particularly tasty and tender, it is also very cold-hardy. It can be picked through winter in many areas. Quick & Hardy, and very tasty. 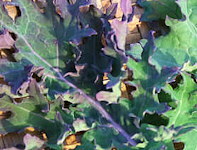 Another amazing new kale from kale expert Frank Morton, bred specifically for home gardeners. It has really tasty ruffled leaves, with pretty red veins, and become rumpled and ruffled as they grow big. 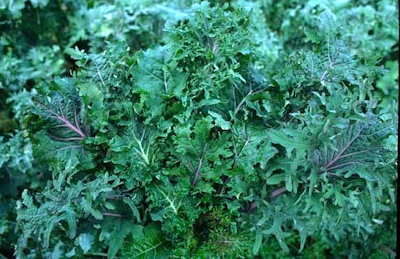 Pick in winter as a normal kale, and in spring it will also produce delicious red kale flower shoots ( aka "napini" or "kale raab") from late March through April. Yum! Beautiful and tasty; what more could you want from a kale? 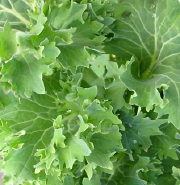 This is a particularly hardy curly kale that grows very tall with crinkled leaves. It can be harvested from late summer all the way through the winter and into the following spring. An ancient and valuable variety from Ostfriesland in North Germany, it is has been grown for thousands of years and is still kept going by a few small-scale farmers. Please note this is incredibly rare, in order to make it available to you we have made up slightly smaller packets than we would prefer, but to be honest 100 or so kale plants should be plenty for anyone. Although this is really a cabbage, it grows very much like a kale, so we've also included it here. It produces a 2 foot stalk with a loose head on top. You simply take the huge leaves a few at a time to eat all year round. You can even keep it going for two years or more. 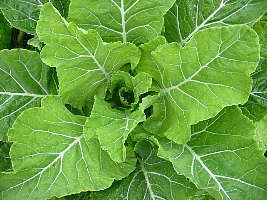 Just cut it back when it tries to flower - it makes new growth, ideal for fresh cabbage in spring during the ‘hungry gap’. Cooks like a cabbage, rather than a kale, and also a key ingredient in the classic Spanish dish 'Caldo Gallego' - which is a delicious leaf, bean, and meat stew. Grows like cabbage, harvested like a kale . Short lived perennial provided the flowers are removed as they form. The mother gene pool from which all of Frank & Karen's napus kales have been derived. Originated as a cross between ‘Red Russian’ and ‘Siberian’ ca. 1984. Intended for mid-July-Aug sowing, fall cropping, and successful overwintering in milder climates to produce copious leaves and “napini” of various shapes and hues. A genetic gold mine for growers who wish to select strains adaptable to their own environment. 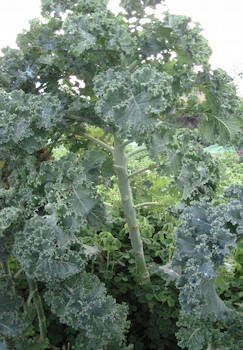 as many of the brassicas (kale, cabbages, cauliflowers etc) will cross with each other very readily. then broken open over a bowl (or old baby bath in this case). - but you can instead winnow them off in a breeze pretty easily if you prefer. Seed-saving instructions are included with your seeds, so you can do this yourself.